What’s wrong with this picture? Efficiency before renewables usually makes the most sense. Thanks to GreenHomes America’s Home Performance Training Manager, Jason Todd for passing along this photo which begs a few questions. When we’re looking at home energy, we like to focus on energy efficiency before we starting adding on renewable energy sources like solar and wind. As Brett Knox likes to repeat “Reduce before You Produce”. This picture suggests that someone may have taken another path. We’ve certainly talked a lot about icicles and ice damming here. And the summary version is they are not good and indicate you’re wasting energy and money. 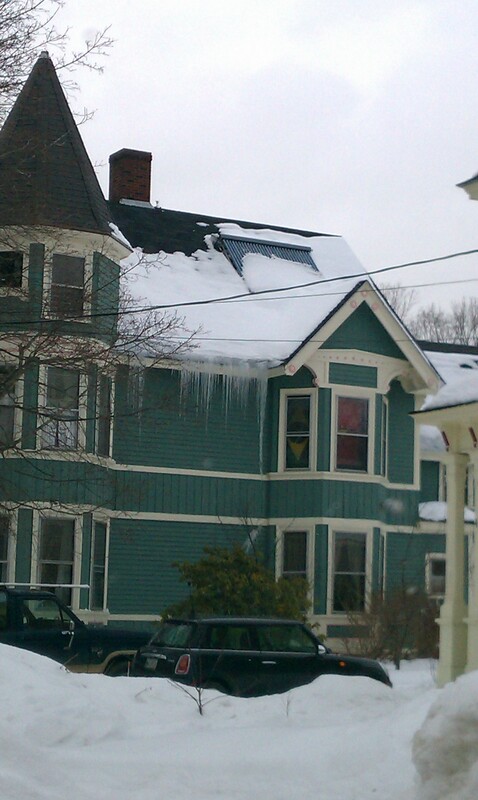 The snow melt patterns on the roof and the icicles suggest that this house is losing a lot of heat through it’s attic and roof. The cost to correct this (with good air-sealing and insulation details) on most homes is generally less than the cost of a solar hot water system as pictured here (partially buried under snow in the center of the photo). And the energy savings, carbon reductions, and other benefits, are typically greater with the efficiency measures than with this system. Further, correcting the heat loss problem helps prevent the possible roof and structural damage that can result from ice build up. This is a case where the economic, environmental, and comfort advantage of efficiency make a lot more sense than starting with solar. Don’t get me wrong. I’m a fan of solar, and we install it. Solar hot water makes sense for a lot of people, and it is a great entree into renewables. Most of the time, though, renewable energy makes the most sense AFTER you’ve taken the low hanging fruit offered by energy-efficiency. Efficiency First! Just in case you aren’t convinced that energy efficiency is important, take a look at this article in Transmission and Distribution World. The North American Electric Reliability Corp. predicts energy demand will grow at a rate twice as fast as resource growth. This means reliability problems may be in store for us in the near future. We as consumers can’t do anything about resource growth, but we can help the other side of the equation – we can lower demand. We can do all of those nagging little things around the house that we’ve been meaning to do for ages, and consequently reduce our consumption. If you do upgrade the efficiency of your home you will be thanking yourself later, and not just in the money you’ll save on bills. A well sealed and insulated home will remain livable much longer than a poorly sealed one in the case of rolling black outs or heating fuel shortages! In his last post Mike touched on a very important issue: When you talk about going ‘green’ with energy there are two sides to the coin, generation and efficiency. Generating green energy from renewable sources such as wind, solar, tide and nuclear (depending on which side of the aisle you sit on you may or may not agree that nuclear should be part of the mix) is a wonderful goal. Make no mistake, as a nation we should be diversifying our energy sources and moving away from fossil fuels, but the other side of the coin is equally, if not more important. Energy efficiency can stretch our precious resources further, and it is something we can all contribute to today. We don’t need an environmental impact assessment to air-seal and insulate our homes. And we certainly don’t need an act of Congress to put on a sweater in the winter. All we need is personal motivation and a little foresight. Speaking of natural gas, the “fracking” debate heats up. Where is efficiency in the conversation? As reported in the Christian Science Monitor, the debate over hydraulic fracturing or “fracking”, is a hot one, coming to a head at EPA hearings in New York. The article is worth a read, and points again to a broarder issue. There is no free lunch when it comes to energy. And generating electricity or heating our homes come at a real cost. Some we pay directly on our utility bills. Others we pay indirectly, on on tax bill, with government subsidies, tax breaks and such, and with increased costs in other arenas such as reduced water quality and other environmental damage that we wind up footing the bill for later. And yet our energy policy and our energy practices pay way too little attention to energy efficiency. The McKinsey report indicated that investing in efficiency could SAVE the country half a trillion dollars. Amory Lovins and the Rocky Mountain Institute have been banging the drum for years (and saving some of their corporate clients millions in energy costs). Linc Services is saving Massanutten Academy almost $7 million. And we know our customers have been saving a lot in homes. But it’s time a lot more people got on board with the common sense approach of energy efficiency first. As we make reduce our energy needs, solving the energy problem gets a lot easier. Congressman Peter Welch and Mike Rogers, SVP of GreenHomes America and Chair of Efficiency First address members of Efficiency First in Washington, DC. May 20, 2010. 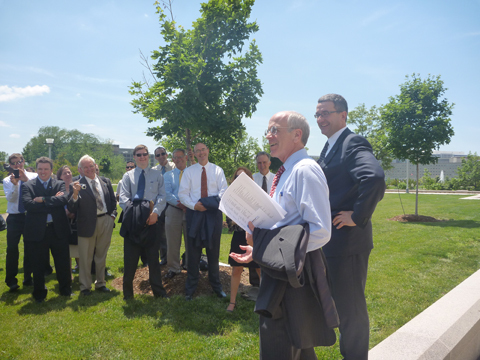 Speaking of good energy policy, I recently visited Washington, DC with more than 100 contractors from around the country to help educate Congress about the potential for Home Star. As part of that, I had the pleasure of introducing Congressman Peter Welch of Vermont who said a few words about Home Star. Home Star is good energy policy, that creates local jobs, and helps home owners fight rising energy costs. Michael Tanesky caught some of the remarks in this video clip. There’s some chatter, including in this weekend’s NY Times, about a Massachusetts Forest Watch report calling biomass energy a “false solution”. Many in the biomass industry and others refute that study. I’m going to stand somewhere in the middle. Biomass energy is likely to be part of the solution to our energy needs. It certainly is in the city where I live in Burlington, VT, where the McNeil generator is a big part of our energy equation. Biomass will be one plank of a good intermediate energy policy. On the other hand, it isn’t a panacea, and the energy we’d create from burning trees and plant matter isn’t going to satisfy our energy needs–at least not the way we consume right now. And we certainly saw an impact in food prices when we start selling food crops for fuel. What’s the alternative? Not really an alternative as much as a starting point is energy-efficiency. Regardless uf how we produce energy–biomass, Gulf oil, nuclear, coal, solar, wind, hydro, or a generator attached to a bicycle–these less energy we use, the easier it is to produce it. The less energy we waste, the less energy we use. This is true at the macro scale for the country as a whole just as it applies in the micro scale down to individual homes. In homes, we can gain efficiency while actually improving comfort and the durability of the home (do it right!). When our clients ask for solar–and we do install solar–we’re happy to oblige, but we point them to energy-efficiency as the first step and the way to get more results for less. So biomass or not, think efficiency first. • Solar electric panel at a total cost of $185,000 with a homeowner cost of $74,000 and a taxpayer cost of $111,000. This amounts to $2,700 in savings a year. • Geothermal heat pump at a total cost of $80,000 with a homeowner cost of $56,000 and a taxpayer cost of $24,000. This amounts to $1,670 in savings a year. • 80 percent reduction in energy use through efficiency at a total cost of $55,000 with homeowner cost of $53,000 with taxpayer cost of $2,000. This amounts to $2,200 in savings a year. Hmmm…that third option sounds better for the homeowner, the taxpayer, and the utility. And speaking of Vermont, Vermont Congressman Peter Welch spoke to that above-mentioned group of contractors Wednesday night at Union Station in DC. Congressman Welch has taken a strong leadership position on energy policy. He was quoted from earlier remarks several times through the week. “We should have the policy of efficiency first.” Yes we should! Oil prices–when they’re up, they’re up, and when they’re down, they’re down, and when they’re only halfway up, they’re neither up nor down. There are people betting prices will go one way or the other. I’d rather bet that I’ll use less by investing in energy-efficiency. And even as the U.S. considers limits on speculation (today’s NY Times), I think we can count on oil prices jumping around–and moving up–in the long term. The long term drivers in increased demand in China and India and decreasing supply remain in place. And short term problems caused by hurricanes, wars, and other unpredictable events will continue to impact prices. One certainty is that prices will be uncertain. Pickens’s Wind Farm Stalls–The Need for Energy-Efficiency Doesn’t! This issue isn’t limited to wind–it would affect coal, nukes, solar, anything where we want to generate massive amount of electricity one place and then move it somewhere else. Generation alone won’t get us where we need to be.